A new study found elderly people with untreated severe sleep apnea were at increased risk for stroke. Based on the findings, the study author recommended that physicians ask all patients with cardiovascular disease about sleep symptoms, especially obstructive sleep apnea (OSA) and send those patients with clinical suspicion of OSA to a sleep laboratory. Elderly patients with untreated severe obstructive sleep apnea (OSA) were at increased risk of stroke but not coronary heart disease, according to a study conducted in Spain and published in the December 11 online issue of Stroke. “This is by far the largest study to look at the relationship between OSA and cardiovascular disease in older patients and analyze the different impact of OSA and continuous positive airway pressure (CPAP) treatment on the incidence of stroke versus ischemic heart disease,” lead investigator Miguel Ángel MartÍnez-GarcÍa, MD, PhD, section head of the pulmonary division and head of the sleep-disordered breathing lab at the Polytechnic and University La Fe Hospital in Valencia, Spain, told Neurology Today in an email. Previous research has shown a stronger association between OSA and stroke, especially in younger people. In the elderly, other studies have shown that severe OSA increased the risk of cardiovascular mortality and that CPAP reduced that risk, said Dr. MartÍnez-GarcÍa. To investigate the association, the investigators conducted a post-hoc analysis of a prospective observational study that took place between December 1998 and December 2007. The cohort included 943 patients aged 65 or older at baseline who were suspected of having OSA and referred to sleep units at two teaching hospitals in Spain. The exclusion criteria included previous treatment with CPAP, unwillingness to undergo a sleep study, and the presence of a central sleep apnea syndrome. To investigate the effect of OSA or CPAP on incident first-ever stroke or CHD, the researchers divided the cohort in two groups: 859 patients without a previous stroke and 754 patients without previous CHD. The average age was 71, and about 40 percent of them had previous cardiovascular events; nearly 50 percent had hyperlipidemia. The endpoint of the study was the first-ever incidence of stroke or CHD. The researchers review the patients' inpatient and outpatient records and computerized databases were systematically reviewed for incident stroke and CHD events. CPAP-treated OSA (AHI≥15 and CPAP compliance≥4 hours daily). The median follow-up was 72 months for the incident stroke group and 71 months for the incident CHD group. Compared with the control group, the cumulative incidence of stroke was significantly higher only in the severe untreated OSA group (OR 3.42: CI 95%: 1.37-8.52), whereas the cumulative incidence of CHD was similar in all OSA study groups. The study authors pointed out that the study had several limitations, including its observational design, use of two different sleep study methods (respiratory polygraphy and full polysomnography), the lack of information about some cardiovascular treatments, and the small number of events. Based on the findings, Dr. Martinez-Garcia recommended that physicians ask all patients with cardiovascular disease about sleep symptoms, especially OSA symptoms, and send those patients with clinical suspicion of OSA to the sleep laboratory. “Patients, even the elderly with severe OSA, should be treated with CPAP until a well-designed, powered, randomized, controlled trial can be conducted to determine the relationship between severe untreated and treated OSA and specific cardio-cerebrovascular outcomes such as stroke,” said Dr. Martinez-Garcia. His research group is conducting a randomized, controlled trial with elderly patients with both moderate and severe OSA to determine the impact of CPAP treatment on their symptoms, quality of life, and cardiovascular prognosis. The researchers are also investigating the impact of OSA or OSA treatment on patients with a high-risk cardiovascular profile, including neurovascular disease, such as those with resistant or refractory-to-treatment hypertension. Clinically significant sleep apnea is highly prevalent in the general population (between 9-15 percent) and considered a risk factor for stroke, said Antonio Culebras, MD, FAAN, FAHA, professor of neurology at SUNY Upstate Medical University in Syracuse, New York, in an email. “Clinically significant sleep apnea, as a modifiable risk factor for stroke, should be treated to prevent primary and secondary forms of stroke. CPAP applications of at least four hours per night, five nights of the week, are considered adequate treatment, but the more the better. Unfortunately, CPAP is not always well tolerated, and other available ways of controlling sleep apnea such as hypoglossal nerve stimulation should be implemented, while research should continue,” Dr. Culebras suggested. He also recommended that patients at risk of stroke be screened for sleep apnea similar to screening for hypertension, diabetes, lipid alterations, atrial fibrillation, heart disease, and smoking. A limitation of this study was the omission of nocturnal oximetry levels in the group with severe sleep apnea, Dr. Culebras pointed out. “Intermittent hypoxia is very common in patients with untreated severe sleep apnea and is a known risk factor for atrial fibrillation, particularly in the elderly. In addition, atrial fibrillation is a major risk factor for stroke, and vascular risk factors such as hypertension and diabetes, commonly seen in this elderly population, are aggravated by untreated sleep apnea,” he said. “The study provides additional support for justifying the treatment of sleep apnea to elderly patients, especially those with severe sleep apnea who have experienced a stroke or are at risk for stroke,” said Charlene Gamaldo, MD, FAAN, associate professor of neurology and medical director of the Johns Hopkins Center for Sleep in Baltimore. But although the study didn't find a significant reduction in stroke or cardiovascular risk in people with mild or moderate OSA, Dr. Gamaldo said, clinicians should not assume that group should not be treated with CPAP. The negative finding could be due to the authors' definition of “CPAP adherence” of less than or greater than four hours daily. If a questionnaire indicates a high probability of sleep apnea, diagnostic tests for OSA include a conventional sleep study (polysomnogram) at a sleep center or an ambulatory home sleep apnea test. The advantages of ambulatory tests include greater accessibility and reduced cost compared with conventional sleep center studies, noted Dr. Gamaldo. Nonetheless, she recommended home sleep apnea procedures be conducted through or with a comprehensive sleep practice accredited by the American Academy of Sleep Medicine, which has established criteria and guidelines for patients undergoing sleep studies. Dr. Gamaldo recommended that future research focus on the impact of longer CPAP treatment and compliance (using the recommended adult sleep duration of seven to nine hours) on stroke and cardiovascular risk for individuals with mild, moderate, and severe apnea. “Would this longer amount of time make a difference, especially since we know that sleep deprivation is a risk factor for cardiovascular disease?” she asked. Drs. MartÍnez-GarcÍa and Gamaldo had no relevant disclosures. Dr. Culebras has received an honorarium from Jazz Pharmaceuticals. •. Catalan-Serra P, Campos-Rodriguez F, Reyes-Nuñez N, et al Increased incidence of stroke, but not coronary heart disease, in elderly patients with sleep apnea: Role of continuous positive airway pressure treatment https://www.ahajournals.org/doi/10.1161/STROKEAHA.118.023353. Stroke 2018; Epub 2018 Dec 11. •. McEvoy RD, Antic NA, Heeley E, et alfor the SAVE Investigators and Coordinators. CPAP for prevention of cardiovascular events in obstructive sleep apnea https://www.nejm.org/doi/full/10.1056/NEJMoa1606599. N Engl J Med 2016;375(10):919–31. 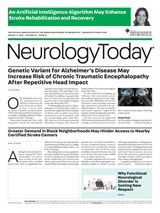 Neurology Today19(3):21-22, February 7, 2019.